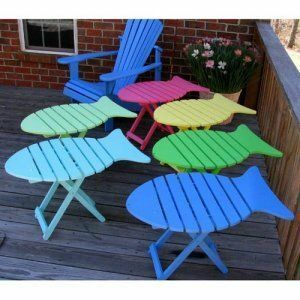 They look like folding tables with the top fish shaped. I did a quick internet search of “folding tables” and came up with a lot of possibilities you can look at. There is one type of folding table where the two halves of the top cross lock which are exceptionally sturdy. All you would need to do is shape the top like the fish. I though I had a drawing for this table but I can’t find it. Here is a Lumberjock that made one. http://lumberjocks.com/projects/332249 He had a video of his work on this page. My improvements on the construction process is to screw the parts together from the bottom sides of the legs and rails so the screws don’t show. This can involve making counter sunk holes so you can use shorter screws. I have seen several other Lumberjock postings using this construction but could not find them right now. if you google “DIY wood TV tray” you will find plans that might fit your project. the folding legs are basically generic – only the top will change to suit your needs. also a few tutorial videos on YouTube: DIY TV TRAY.